Comcast has been justifiably criticized for blatantly trying to curry favor with the FCC by trying to spend $110,000 to sponsor a fundraiser honoring FCC Commissioner Mignon Clyburn, but while the Kabletown Krew shrugged off those allegations, Comcast EVP David “The Merger Whisperer” Cohen was meeting with the FCC to push the company’s slate of semi-truths about its pending acquisition of Time Warner Cable. In a letter posted to the FCC’s docket on the merger, Comcast recounts the details of an Aug. 11 meeting between Cohen and various FCC officials. In the meeting, Cohen took issue with merger opponents’ claims that a combined Comcast/TWC would control around 50% of the national broadband market. He cited an earlier letter submitted by Comcast calculating that the number would be closer to 35.5%. In a particularly ballsy move, Comcast uses the FCC’s own data to make this point. Surely Big C wouldn’t dare try to pull one over on the FCC with its own numbers, right? Yes, this chart lumps in every form of fixed-line broadband with downstream speeds of 3Mbps or more. So Comcast is lumping itself in with all those cruddy DSL lines that don’t even meet the FCC’s current — and already-outdated — definition of broadband as 4Mbps downstream. So yes, if you include all the various regional telecom companies offering Internet service that will barely allow you to stream a Netflix movie, a combined Comcast/TWC might only account for 35.5%. If you were to move the bottom limit up to 4Mbps — or up to the more realistic broadband standard of at least 7Mbps — that number would certainly increase. But honesty only hurts Comcast’s case. The above chart also makes the claim that a combined Comcast/TWC should really only be thought of as controlling 15.5% of the broadband market, since wireless broadband is a competitor. Comcast charges around $50-70/month to most broadband customers, depending on bundles, speed, and region. This includes a monthly data threshold of a few hundred gigabytes. Wireless companies charge a similar monthly rate (for just data; nevermind device costs or charges for voice) but most plans cap at between 2-5GB/month. So, in terms of per-GB costs, wireless data currently costs about 100 times what you get from fixed broadband. This will inevitably change, but there are no indicators that wireless companies will open up their caps to allow for the same usage limits enjoyed by fixed broadband customers. Additionally, broadband from pay-TV providers allows Comcast to bundle in TV service. Wireless broadband may offer live streaming of all sorts of video, and download speeds may be comparable — if not sometimes better — than cable, but no wireless companies are offering a live-TV over-the-top service with a channel lineup rivaling cable providers. Until that happens — until a consumer could reasonably consider a wireless data plan as a replacement for fixed broadband — this is a nonsensical point that only makes Cohen and Co. look bad. “[T]he broadband marketplace is competitive and dynamic, and consumers enjoy ample and growing choices of broadband providers,” reads the letter. Please, someone show us this magic land where consumers have the choice of multiple broadband providers all offering high download speeds at a decent price, because most of us have the choice of broadband from our cable company and DSL from the phone company, and that’s it. 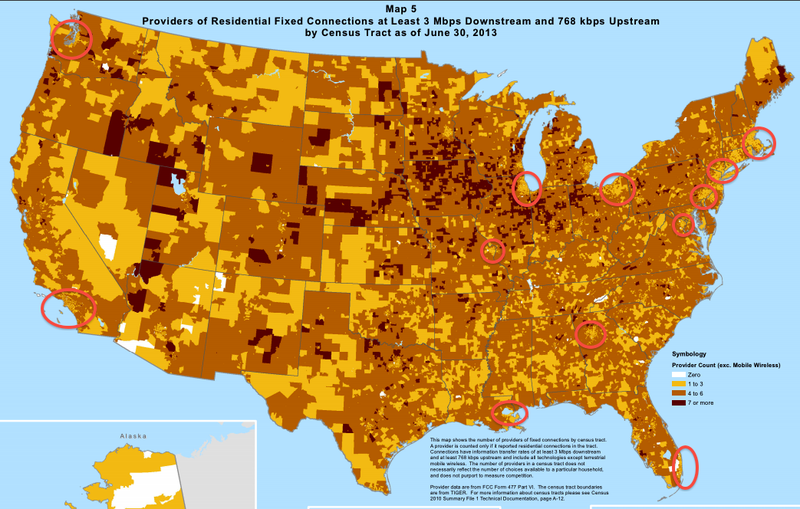 In addition to the wide swaths of rural land with few broadband options (again, this uses the outdated definition of 3Mbps or better), many of the most densely populated metro areas in the country — Los Angeles, Atlanta, Miami, Chicago, St. Louis, Seattle, New Orleans, and basically the entire D.C.-Philly-NYC-Boston corridor — have few options for even barely acceptable Internet service. Approving the Comcast/TWC merger will do nothing to change this map. It will only change the name of the company that screws up the billing for the customers in these areas. But Comcast’s argument that you can’t take away competition when no competition exists runs counter to its other core claim that the “marketplace is competitive and dynamic.” Cohen is trying to have his cake and claim it’s a hot dog. But what the company is really asking is for the FCC to allow Comcast to protect itself by buying its way into the nation’s two largest markets — L.A. and NYC — without ever having to compete or win over consumers.